I continuously tell people who want to travel to Myanmar that they ought to avail themselves of information before they go. Read up on the history, learn as much as possible about the complicated geopolitics of the region. And of course, stay updated about any conflicts in the more remote areas, like the Kachin State in the north or Shan State to the east. 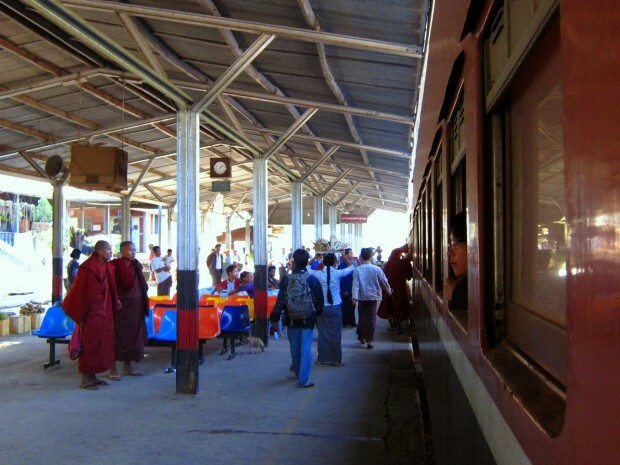 During my visit to the country, the north was calm and I ended up taking a 24 hour train from Mandalay up to Myitkyina for the Kachin State’s annual manaw (state fair). 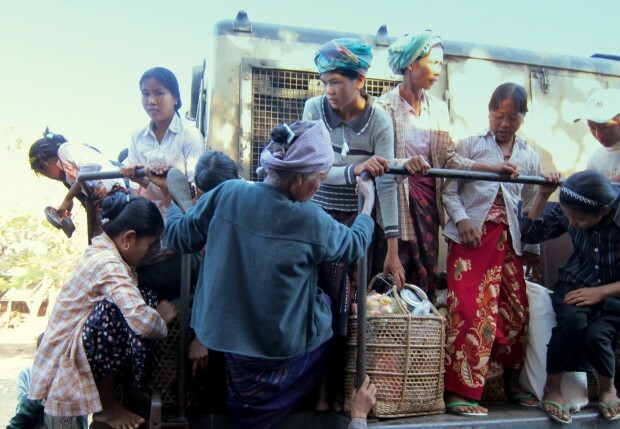 Arriving in Myitkyina, dazed after the long and bumpy ride, I had a few days to get to know the town before the annual fair began. I’ll post on the fair and Myitkyina itself shortly, but the trip was worth its own entry. Note that from recent news, this ride is temporarily off limits and access to Bhamo is restricted too, due to flare ups in fighting. 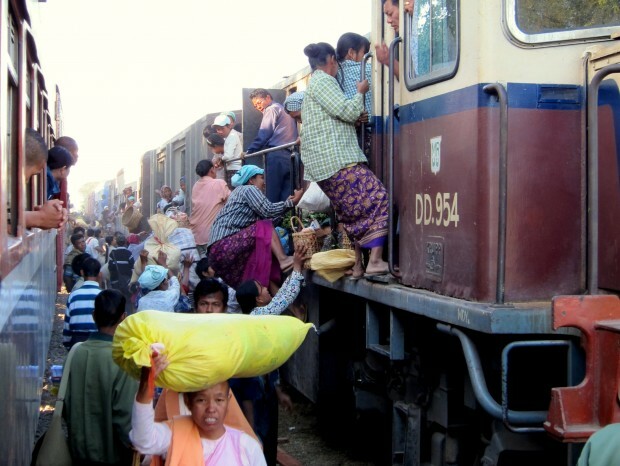 Train from Mandalay: not the most efficient choice! I already needed a half-day to recover from the bus to Mandalay, and a flight seemed like the fastest way to arrive (and the easiest too). But I was wary of spending money on flights, both because of where that money went and how little access to funds I had inside the country’s closed monetary system. I made up my mind fairly quickly that I wasn’t going to be leaving anytime soon, and extending my ticket meant that I’d need to spread out my dollars and kyat a little more thinly than planned. So, the train it was. Another centrally-run enterprise, tickets were considerably cheaper and a friend who had taken the ride prior promised an eye-opening experience, full of colour and chaos. The train was terrifically rickety, covered in alternating layers of rust and grime. 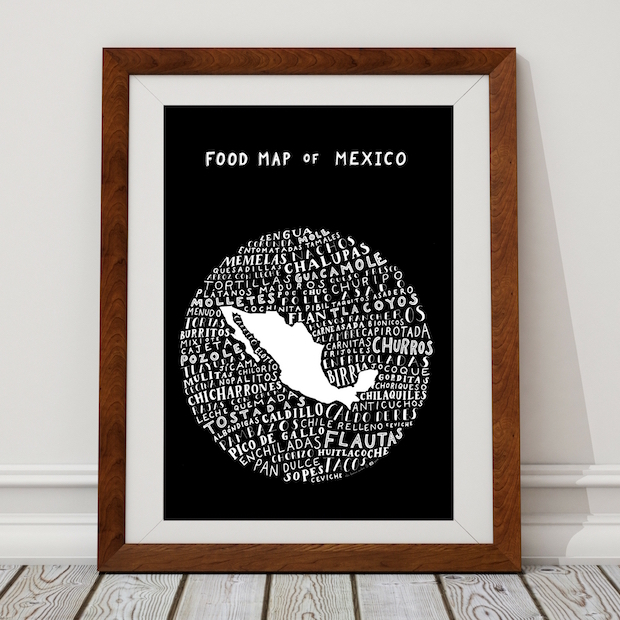 Spider webs coated the ceilings and the narrow hallways were packed with people and cargo and all sorts of produce. 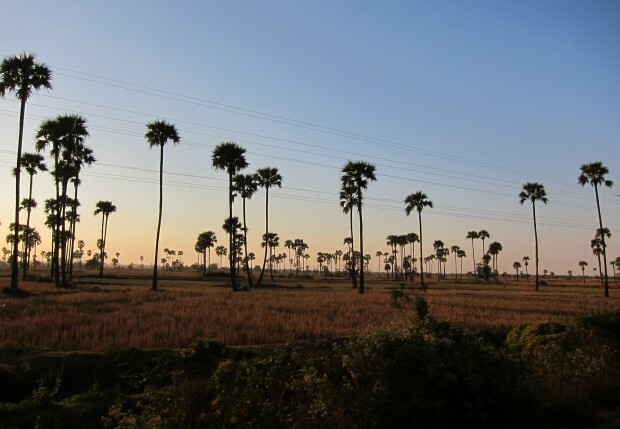 I’ve always advocated public transportation as the best way to get to know a place, and a train ride is no exception; those 24 hours from Mandalay were a fascinating snapshot into a country I already wanted to know better, both good and bad. The train left in the mid-afternoon and chugged through half-logged forests and tiny towns, stopping every few hours throughout the night to cough out passengers on the side of the dusty tracks. Definitely not a boring ride. As the afternoon wore on, the scene went from city to forest to smaller towns. 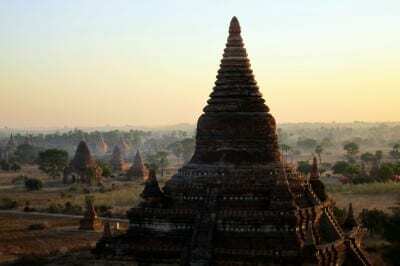 Sun-streaked temples were built next to the tracks, their stupas glowing in the late afternoon light. Every tiny stop along the way made for a fun encounter, from buying the samosas and fried corn snacks piled high on the sides of the road, to conversations with those inside the train, what little words we had in common. When I got on the train the police came to say they were here if there was any issue – just let them know. 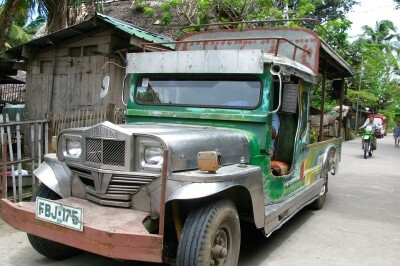 But as the trip went on, I’d see them outside the car, pointing at me to the curious onlookers with a wide smile. Tourists on the train – look! They would catch me watching them and give me a sheepish grin. It wasn’t just the police, either. Popping my head out the window at any given town immediately drew a crowd. From the women selling snacks on head-held wicker baskets to the clusters of children that found their way my window as soon as the train sputtered to a halt, it was an amusing, privacy-free afternoon. 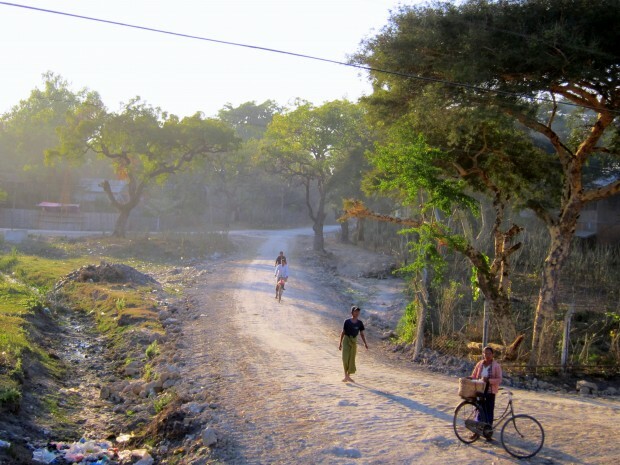 While tourists were few and far between in some parts of Mandalay, the trip north made it clear that they were rarer up near Myitkyina. 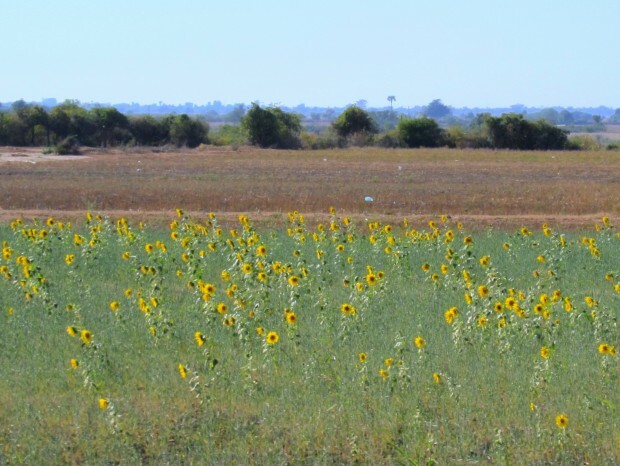 Sunflower fields on the route. Sun-drenched roads alongside the train. In that last stretch before dusk, fields gave way to sparse palms and tried to capture some of the rainbow dusk as the train pushed through toward the north. 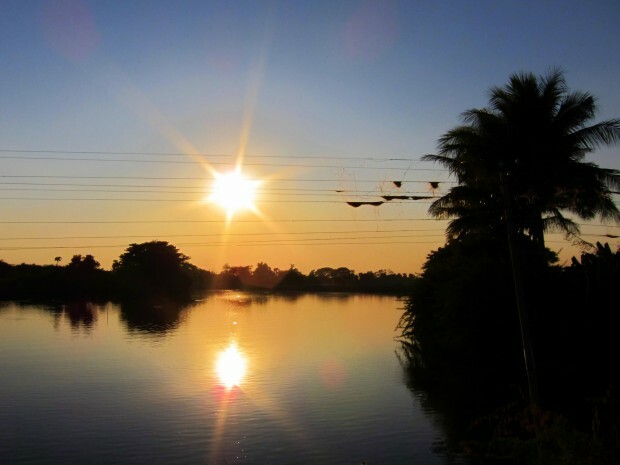 On my return ferry ride down the Irawaddy, the scenes were completely different, though the parallels remained: crowds of people confused about my presence, piles of snacks and shared food and bright, thanaka-covered faces smiling from ear to ear. Throughout the day, I was distracted from the chaos outside by a vaguely unquantifiable smell. Sour plums were stuffed in canvas bags under my seat, stinking up the surrounding berths. I actually didn’t realize that they were there until a particularly forceful shove in the middle of the night forced the train to grind to a halt abruptly. Out rolled a dozen tiny plums, the smell growing stronger. Rotting fruit explained my wrinkled nose quite well and I learned an important lesson: check under your seat when you get on the train – you never know what will be there. It was a sleepless night. Squished into the train with its loud noises and jarring movements, I was struck by the serious contrast to the infrastructure in far more barren Siberia where I slept quite well, perhaps due to the vodka foisted upon me by my cabinmates. 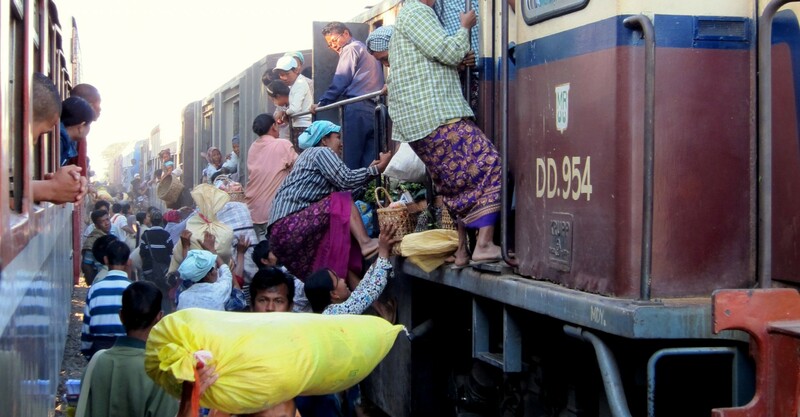 Somewhere in the darkness between Mandalay and Bhamo soldiers got on the train, tromping up and down the aisles and waking people up to look for something, or someone, barking loudly in Burmese. Throughout the night, small stretches of quiet were broken with the hissing of the engine or someone’s radio broadcasting news in staccato bursts. A monk, swathed in his burgundy robes and a matching sweater and hat, stood in the hallway gazing out into the night and talking loudly to his friend. Soldiers came on again, soldiers went off. At 4am I had to pee and I tiptoed to the end of the car in the darkness, slamming against the walls as the train rocked unevenly along the tracks. Soldiers sat huddled side-by-side in the hallway, pressed together for warmth with their guns laying at their sides. Weaving between them, they looked up in surprise – I’m pretty sure I was the last person they expected to see on that slow train. Their white smiles reflected off the flashes of lights at the side of the tracks; watching their wary friendliness, I wondered what they thought I saw in them. By morning, they were gone. 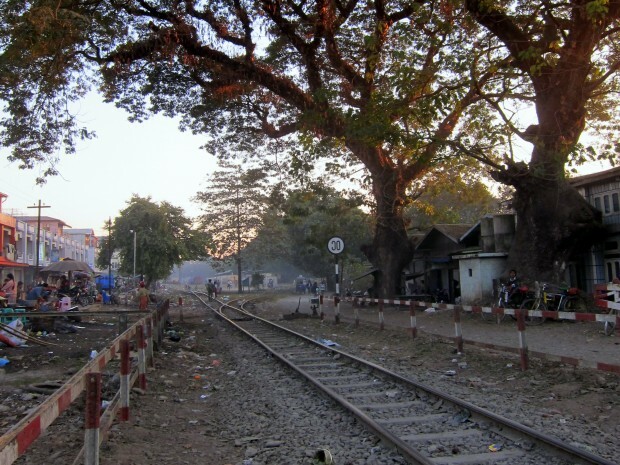 The train arrived in Myitkyina as the sun was rising, covering the tiny town’s tracks in a misty haze. The entire place centred around a small space between those tracks and the Irawaddy river just over the horizon. The market stretched out from where the trains stopped, winding its way through town till the water’s edge. It would be a small town to explore but one that brought me great joy (and a terrible bout of food poisoning). But first things first: there was breakfast to be had. 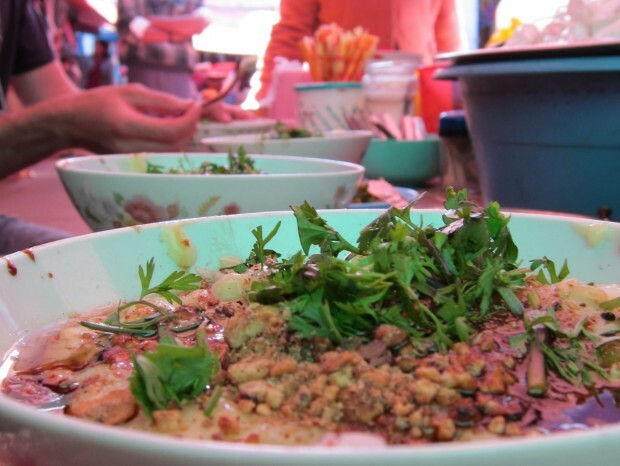 Breakfast of champions: Shan noodles with silken tofu, peanuts and fresh herbs and spices. More to come from Myitkyina, including the State Fair, in my next post. 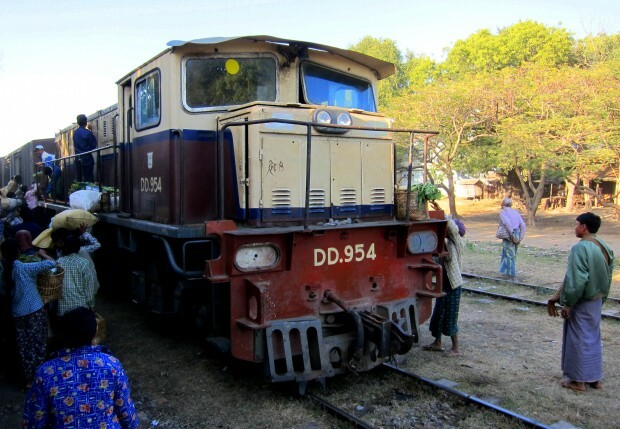 For more about train travel in Burma, see Seat 61 and The Wandering Wanderluster. I also recently wrote a post about this very same train journey and it is hilarious to see the differences between the two. I agree with everything you said and found the journey fascinating as well. At the same time, I was hating life pretty much the whole way. I didn’t do so out of pessimism though, but simply for the humor. Misfortune is funnier than amazement. I also really loved your pictures from Myanmar. Seeing them made me go back through my own, which always brings back wonderful memories. Oops, I forgot to finish a sentence in my post, but I couldn’t figure out how to edit it, so I just posted it again. I hope that’s alright. I also recently wrote a post about this very same train journey and it is hilarious to see the differences between the two. I agree with everything you said and found the journey fascinating as well. At the same time, I was hating life pretty much the whole way and that’s the aspect I focused on in my post. I didn’t do so out of pessimism though, but simply for the humor. Misfortune is funnier than amazement. We have experienced the same commotion in India…Though we learnt our lesson and boarded a luxury train for visiting places such as Rajasthan, Agra and Madhya Pradesh. We were pleasantly surprised that these luxury trains in India provide quite the opposite experience than what local trains had to offer. It was a great experience. This was from 2009 – not a clue what the time table would be for today, or if the route is even the same. You’d be best checking a travel site that is updated as a guide, versus a narrative one. Apologies! Hey Jodi! Thank you for including my link! This post is great – gives a great sense of what the train journeys are like! 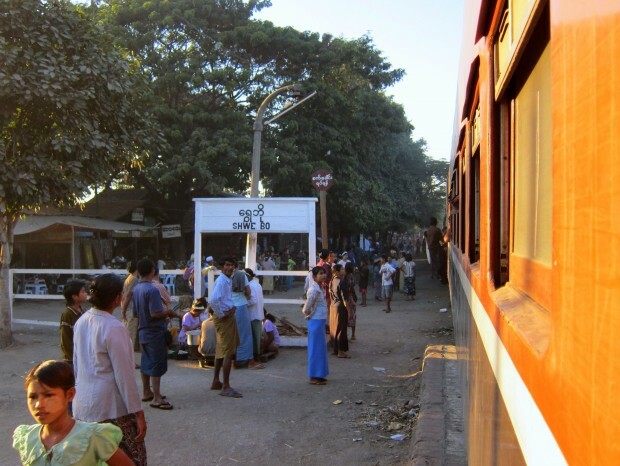 I miss Myanmar so much and although the trains were bumpy as hell I’d do them all over again!